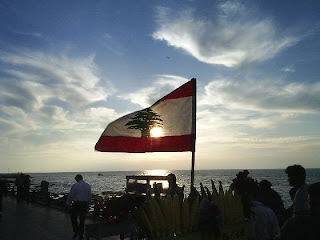 Blogging from .. Beirut ! Country : Lebanon – Beirut. Blogging from : the Hotel Room . This past two weeks were out of my usual serene calm world I’ve always knew, mostly loud , hectic and so little rest or sleep. I have arrived from Cairo on Friday, spent Tuesday in Damascus for two business meetings, and right now , I am in Beirut !!!! I still cannot believe that all of this moving around is real. Me being in three different countries, in less than one week! Actually, if I extended the week into ten days , then they’ll be five countries ! I am suffering sleep deprivation, ongoing stress, God knows how many deadlines have to be met and follow up actions required , however the worst part of all is I barely see my family or my friends , I feel totally disconnected from the life I know . however , along with all of the above , a part of me is enjoying the adventure that comes with being in a different place every now and then . The flight was quick and smooth; my neighbor was a Lebanese man, offering free information about Lebanon. I was planning to take a short nap during the flight, however, with the ongoing shouts & giggles of the young passengers sitting in front of me, and my friendly and talkative neighbor , my nap plan went down the drain. I am supposed to wake up early tomorrow, we have one meeting , and then we are catching the afternoon flight back to Amman , which wont give us any chance to tour around . to tell you the truth I kind of hope to miss the afternoon plane and go for the night plane , to look around during the evening, but the idea of rolling my bag in the streets of Beirut is a bit unpleasant . I kind of feel disappointed a bit , thinking that I am in here Beirut , yet unable to see any of its places. But I guess I will have to come back on a vacation sometime. I am starting to see numbers and pillows flying around the room , a side effect of sleep deprivation and a clear sign that tells me its time to sleep . So , I’ll hit the bed , and I shall be posting updates soon. In less than one month, I had two trips to Cairo, but this time it lasted longer, a whole week spent in the city that knows no sleep nor rest . I guess being alert, workaholic and always ready for more work is a part of the genetic composition of the people of Cairo! This time , I had to go to Cairo alone , and meet up with a colleague coming on another trip from a different destination. My flight was okay , it takes less than an hour to fly from Amman to Cairo , and between elevating and landing with the snack in between , one can hardly feel the time. One cool thing happened to me this time , was meeting an old friend from university days whom I haven't seen since graduation , it was a lot of fun to catch up with him about life and everybody's news . I am always hit by this refreshing wave whenever I meet someone that I used to know from university days and have not seen for a while ! its always fun to catch up about others news , and know which docks their life boat sailed them to . 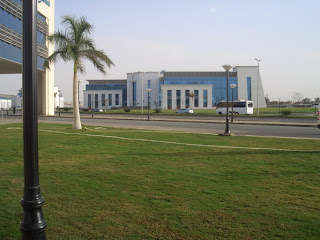 This time , I got to see the day life of Cairo , the days were extremely busy , leaving hotel on a very early time , to catch up a meeting or two in the smart village , which by the way one of the cleanest , most mordent places my eyes spotted in Cairo. Other than this , our attempts gone with the wind trying to reach any destination on time , the traffic in Cairo is a killer indeed , and this makes me wonder if any one keeps an appointment over there . This time I was lucky enough to have a peaceful seal in the great river Nile. 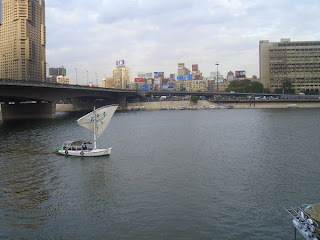 The sensation was unbelievable , to set in that boat , at night staring at Cairo lights all around , and enjoying the peaceful gentle movements of the boat , very relaxing , and I would guess romantic as well if the right people were around . On my last day there , and after our final presentation , we went to pyramids . 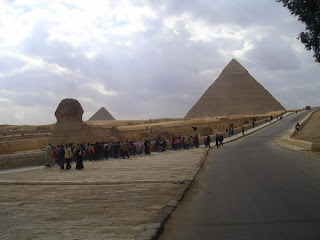 the site is magnificent , the enormous size of them , makes you wonder how could they build it , in the size of a mountain , rocks shaped equally and piled up in that pyramidal figure . I guess everyone had the same wondering , staring at the top of the biggest pyramid , perplexed with delusion of it moving forward the longer you stared at it . I've been always amazed by the pharos culture, and will always be. I was finally free to do some shopping, after we got back to the hotel . Fighting the exhaustion and sleeplessness I had out of waking up early and sleeping fairly late , I decided that it was my only chance to check the modern Cairo and pay City Stars mall a visit. So I went there, on my own , was a bit freaked out about moving at night but then all went just fine , and on top of that I managed to buy two pieces that I can't wait to wear :) . So , my next destination would be .. Syria , Lebanon , Pakistan , all of it .. I guess I’ll keep you updated ! I am not really sure if I do. I had few incidents that made me stop believing in them, thinking that a decision or a feeling could possibly be taken or felt depending on random flying signs , that "happened to" match the mode of thinking you had for that period or day . But how come that, sometimes, a thing happens that you don't give a lot of thought. And then, it happens again, so you pay attention to it. And then that thing forces itself to show up once more, so it finally attracts your attention and curiosity. And just like that, it gets a spot in your awareness of surroundings. And afterwards, the thing stops its pushiness into your life. So you wonder, but you do not over do it , until, it comes back, but this time with signs. All related to the subject of matter, but in different forms and three times in one day. Three very obvious and very subject related, where each sign feels as if it screams about its notion! Wouldn't that nock your mind off and make you think.. What does this mean? So do I believe in signs ?! I don't know.. I am very tempted to, despite the fact how misleading they could be , I am attracted to the thought. I guess , I'll be a better judge of that tomorrow , when the signs intensity demolishes , and things are normal again ..
* After you die (----) what's going to happen to your e-mail? - Will die with me I suppose , I hope no one will peak on it , TOP SECRET contents .. lol ! * Have you ever given your password to anyone? - Can't remember I did, but for work domain, yes of course ..
* What kind of a relationship you have with those? - To give my work domain password .. They definitely have to be colleagues . - Chemistry B Sc. , but my work is not related to my study AT ALL , I work in a sector related to technology and telecommunication. * What kind of personality do you have? - I am a clam person in general, and shy, however, with friends I get loud and fun, I love laughing. I hate hurting people's feelings and I myself can be hurt easily. 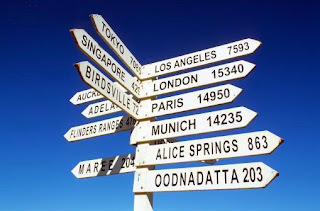 - I am not sure , every time I travel I gain an extra experience , but also , preparing for a trip kind of stresses me ! - Depends, I am usually an easy going person, but I have my bad "do not even dare talk to me" days ..
* What do you do in your spare time? - Gym, friend's hangouts,sitting with family , reading, TV , internet , walks around the block. - Mlokhiyeh , Beef Stroganoff , My mother's Chinese and pastries .. Actually ..Everything Mom makes. * Things you inherited from your father? - His good heart, love for knowledge, and occasional bad temper. * Things you inherited from your mother? - Her warmth, kind heart and innocence, and I hope her good cooking! * 6 things you hate? - here are they randomly : Deadlines and getting stressed about them , gaining weight and not being able to control it , dirty mouth people, liars and deceivers , a family obligation after a LONG day at work on a work night , me when I have the blues ! * 6 things you love? - My family, my friends, my work (most of the time), my hair, my books and honesty . * Define computer and Internet. - Without them a big part of my life won't exist. Thanks nido :) .. that was a lovely break from serious posts ..